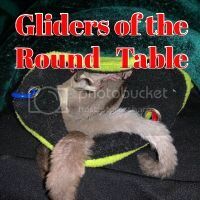 My gliders love tent time but there are only two sides they can use as the tent is nylon. The mesh screen doors on each side are fairly large but I have been racking my brain to add...something! Something that would enhance their leaping to and from me! Get some fleece, cut into long 1- 1.5" strips, like 4' long, braid and knot them with a loop at each end. Hang inside tent where one or two are near the floor, and use safety pins to hang high. Do a crisscross or two up high. It usually becomes a game for them to jump to you run, climb and do again. Last edited by Ladymagyver; 01/21/18 08:43 PM. Thanks for the picture! I will do that tomorrow. Today they were in a biting mood-something brand new but it may be they saw/smelled our two Border Collie X's as they usually are not in the house at that time. I was startled the first time and pulled away but after that i kept my hand there and they eventually pretty well stopped. It was mostly Freddie although Barnie did at least once. They are now back in their cage and going to town on their wheel! Well, today's tent time was awesome! Thanks Dawn for the picture! I didn't think the tent would stay upright with something on those little tie backs but it worked perfect! No biting tonight and lots of play time! LOL! I even wore shoes and ear muffs-just in case! I also placed a sheet on the floor and they had several races! You're welcome! I've learned they will go up anywhere if a braided rope is available! Lol! The little buggars! Freddie and Barney are hilarious! Today Fred tried to "push" me out of his way! LOL! 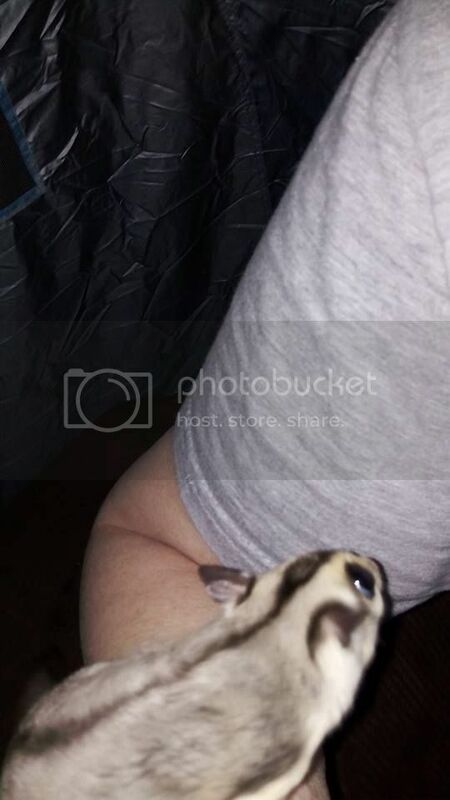 It was very comical and then they both ended up in my shirt and wouldn't come out. Finally, I realized that I had forgot to turn the fan off and once it was off, they played like crazy! They can now leap completely across the span (a little over 6 feet)! I have a concern though, they nibble at my eye lashes and not sure why! Anyone else ever have this happen? They like to sit up on my hair and then will lean over and lick/nip my eyelashes! They don't bite but it does make me nervous at times-not enough to stop them though! Last edited by Claralice; 01/23/18 09:57 PM. Tucker used to try and groom up in my nose. They just think you need to be groomed there. LOL! I would sneeze like crazy! So, no worries but good to know.